Beetroots in stripes made by Spilva classic recipe in mild marinade. Ideal for main course. Can be used to prepare soups and salads. Shelf life unopened – 36 months. 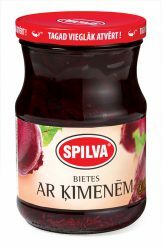 Beetroots are packed in 0.58 l glass jars. Product 100 g contains: energy value – 41 kcal (172 kJ), protein – 1.7 g, carbohydrates – 10.8 g, fat – 0 g, salt – 1.4 g.